“Germany Has Declared War on Russia. Swimming in the Afternoon.” Kafka – diary, 1914. The quote from Kafka’s diary in 1914 unveils a dilemma between the collective consciousness verses individual behavior. Often times while listening to the news on the radio or reading the newspaper, we feel very strongly about the injustices happening around the world. On the other hand, even after such moments, our everyday life continues the way it has always been as if nothing had happened. In this video, I wrote Kafka’s quote on my hand as a reminder of the mixed feelings of confidence and defeat of an individual’s effect on the society. 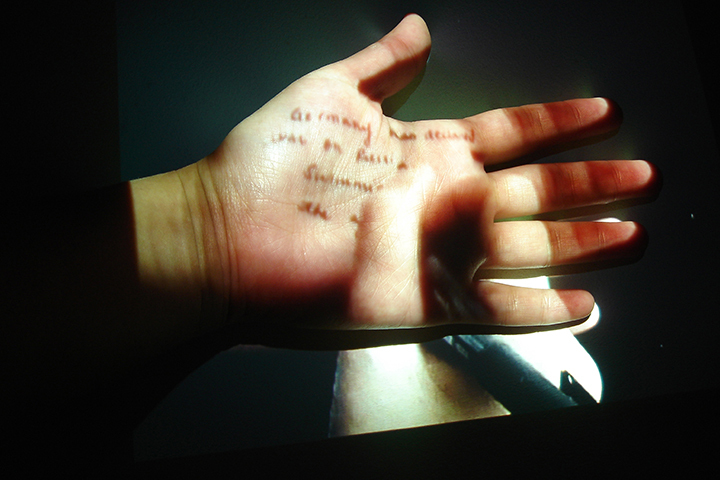 The video is projected onto a table where the viewer would put his/her hand on top of my projected hand. It is as if I am writing the quote like a note of reminder on their hands. Then as they walk away the writing fades as well.